Larry Howlett wants to know why the e-mail he downloads on one PC doesn't show up on the other. He uses Outlook on both computers. Accessing a standard, POP e-mail account on two separate computers is bound to cause problems. When you download the mail, your e-mail client (Outlook in Larry's case) erases the messages on the server. Thus, you end up with a different set of messages on each PC. The simplest solution would be to tell your client to leave the messages on the server, if only for a few days. In Outlook 2007, select Tools, then Account Settings. Double-click your account. Click More Settings, then the Advanced tab. Check Leave a copy of messages on the server. Handle the options below as you desire, then click OK, then Cancel to get out of the wizard, then Close. Another option: Check with your e-mail host and see if they support IMAP. Like POP, IMAP is a standard e-mail protocol. 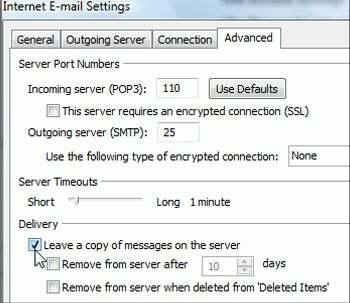 But unlike POP, it syncs your client (and yes, Outlook supports IMAP) with the server, rather than just uploading and downloading. But the best solution, in my opinion, is to give up Outlook and start using a web-based email client. If you're checking your mail on more than one computer, this is infinitely easier, and you simply don't have to think about syncing because your client is on the Internet, not on the computer.